We originally planned to go from Cortona through Florence and Lucca to the Cinque Terre - however since I was recovering from a broken knee we decided to base ourselves in Florence and ride from there to surrounding venues. We were not disappointed. 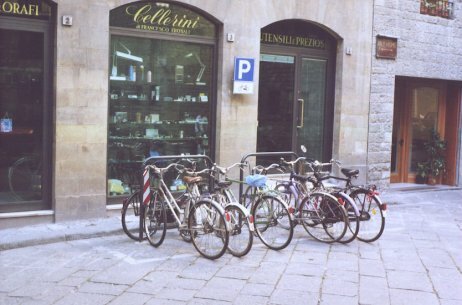 Florence is a bicycling city - by pure necessity of survival. Thousands of bicycles and "motorinos" mingling with cars, vans and buses in utter chaos in the narrow streets - ignoring "no-entry" signs with impunity. It took only one day of pure panic for us to catch the principal, and off we went. Nili would say "follow me" and up the one-way street we went (the wrong way, of course) with a bus coming towards us. Somehow by some form of magic it all came together. No one hooted or was impatient, everything just flowed. There are no recumbents in Florence (in fact I never saw a recumbent during our entire trip) and we were a major attraction. Nili would say proudly: "Il mio marito ha disegnato e construito le biciclette" and I would smile sweetly as they would look at me in awe and say "Ho... complementi... Leonardo..."
Below we see a typical scene in Florence - all the bicycles seem to have the same upright old fashioned style, as though taken from a previous generation. Bikes for all ages, everywhere - again a typical scene in a quiet side street. Getting there and where to stay?